This has to be the easiest skirt I've ever made! 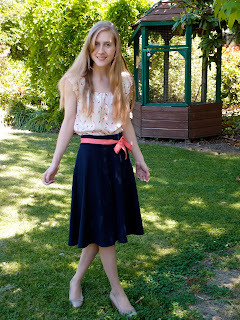 I copied this skirt from ModCloth.com. Here are my instructions for making your own paper bag skirt. It's yet another rectangle skirt. Measure around your hips. Add 4cm for seam allowance and ease (or however much you need). This is your fabric width. Measure from 5cm above your natural waist to your knees. This is your fabric length. 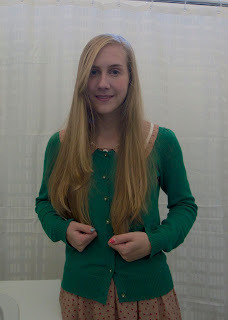 Cut out your rectangle, and hem the top. Insert a zipper into the back and sew up the back. You should have a tube. Here's the "tricky" bit. Measure your waist. Work out the difference between the hip measurement and the waist measurement. Mine was an easy 28cm. Divide by 4. This is how much fabric each pleat should take up. So, each of my pleats took up 7cm. Make 4 inverted box pleats around the top of the skirt. I made mine about 10cm from the centre front and back of the skirt. First mark the centre point of each pleat with chalk, then measure the 7cm (or whatever) around that. So for me, it was 3.5cm on either side of the middle chalk mark. Make your pleats, and make sure you pin them about 5cm from the top of the skirt. Try it on at this point and adjust pleats as necessary. Baste. Take a 2.5cm wide ribbon of your choice and pin it over the pleats, making sure it's straight all the way. Sew it down. Hem the bottom of the skirt to where you like it. Yay you're done! Easy peasy! I'm glad it was easy to make and it looks awesome. YAY!